Trump claims he had better meeting with Putin of Russia, but many of bipartisan lawmakers consider this summit as “nothing short of treason” or "“disgraceful", "shameful"
President Trump dug in Tuesday amid bipartisan criticism over his press conference with Vladimir Putin, claiming the “Fake News” is ignoring what he described as a successful summit — and his tough stance with NATO actually helped the alliance counter Russia’s influence. House Minority Whip Steny Hoyer, D-Md., said Trump’s remarks were “nothing short of treason,” echoing comments from Obama CIA boss John Brennan. But Trump tweeted Tuesday that his NATO meeting, where he pressed allies to commit more in defense spending, as well as the Putin summit were a success. Further, he argued his actions at NATO would be bad for Russia. Trump angered members of both parties by saying both countries are to blame for damaged U.S.-Russian relations, and letting Putin deny election meddling unchallenged. Trump said he has great confidence in the intelligence community, but Putin gave a “strong and powerful” denial. He said he doesn’t “see any reason why” Russia would be behind election meddling. “I do think that the findings … during the end of the Obama administration provides a road map to what the Russians did, as do the indictment of the 12 Russian GRU intelligence officials. And we’d better wake up,” Senate Majority Whip John Cornyn, R-Texas, said on the Senate floor Tuesday. Sen. Jeff Flake, R-Ariz., another Republican often critical of the president, also blasted Trump. 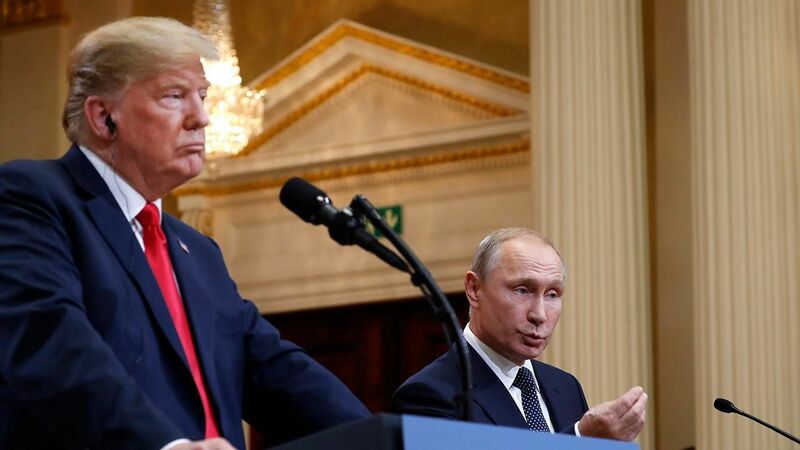 “I never thought I would see the day when our American President would stand on the stage with the Russian President and place blame on the United States for Russian aggression. This is shameful,” Flake tweeted. Senate Democratic Leader Chuck Schumer made similar comments, while calling on Congress to ratchet up sanctions on Russia in response to Monday’s events. “What the president has done is an insult to all Americans,” Schumer said. Even some of the president’s closest surrogates, like former House Speaker Newt Gingrich, criticized his comments. The president, on Tuesday, thanked Sen. Paul. “Thank you @RandPaul. ‘The President has gone through a year and a half of totally partisan investigations – what’s he supposed to think? '” he tweeted. Fox News’ Chad Pergram and Anne Ball contributed to this report.